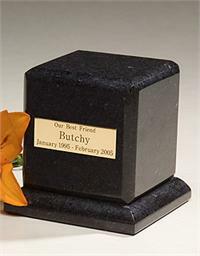 Black Granite with square base are the features of this beautiful, heavy urn. Shown with optional plate, but will also accommodate our bronzetone dog bone applique to make the piece elegant and unassuming. Please see bottom of page for more details. Due to the nature of stone, pattern and color will vary. Closure: Bottom-opening threaded stopper. 4 1/4"W x 4 1/4"D x 5"H 75 cu. in. Urn Weight: 5 lbs.